Whoops - quite right. It does NOT drop from the void, just the normal one does. I apparently went to the wrong item. Sorry for any confusion anyone had. well whats this for ? 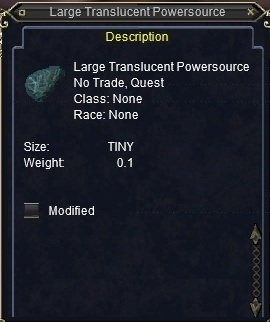 tenish requests on a transluctant powersource but not a LARGE one .. just tried to turn it in for gloves. not worked out. I believe the dude you hand this into (plus old armor) is Terraxs. Still in CR he is. It's for the raid tier armor. The normal sized are for the group quest, the large for the raid. Drops off of Laila the Forgotten in Ashengate.